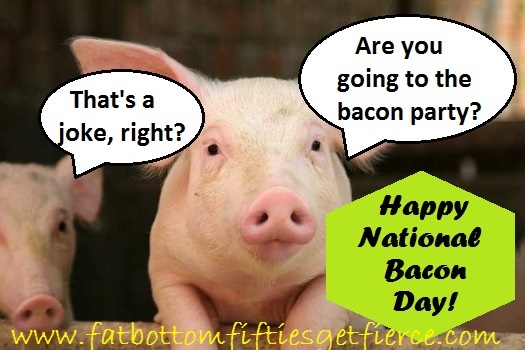 OK, celebrating National Bacon Day may not seem like a good thing at first – but wait! Even those of us who are working to be less fat-bottomed and fiercer can celebrate these foodie days and still meet our goals. The older we get, the more the ‘everything in moderation’ maxim rings true. If we allow ourselves a once a year celebration of bacon, I for one, know it will be better than the continued indulgence throughout the year. This unofficial holiday was started in 2000 by residents of Craig in Bradford, MA. Here are five reasons to celebrate National Bacon Lover’s Day. Even if you choose not to participate, it’s always nice to be on top of these National Celebrations so you can at least be part of the conversation! 2. The Best Bacon Jam: A little spread on a bagel or whole-grain bread and you have breakfast on the go! 3. Bacon-Wrapped Onion Rings with Spicy Sriracha Mayo: Talk about impressive! I can’t think of anyone who’d fail to be impressed when served this delicious appetizer! 4. Secret Ingredient Cooking Contests. International Bacon Lover’s day is meant to be a social event – and how much fun are secret ingredient cooking contests?! These Beer Batter Chocolate Cupcakes with bacon frosting have CELEBRATION written all over them! 5. The Office Quote that makes me laugh. In less than 30 seconds he explains how to wake up to crackling bacon. Here – I’ll let him tell you himself! For more bacon magic here are two more posts you may enjoy: (1) For a month’s worth of bacon recipes and a chance for a free bacon cookbook, check out Kelli’s Kitchen. (2) For 5 quick bacon and romance ideas, visit The Perfect Marriage: Bacon and Us!